There are some weaving terms that may mean different things to different people. I think “production weaving” falls into that category. Sometimes production weaving means putting on long warps to maximize weaving versus set-up time. The longer the warp, the more you can weave before you have to rethread the loom. 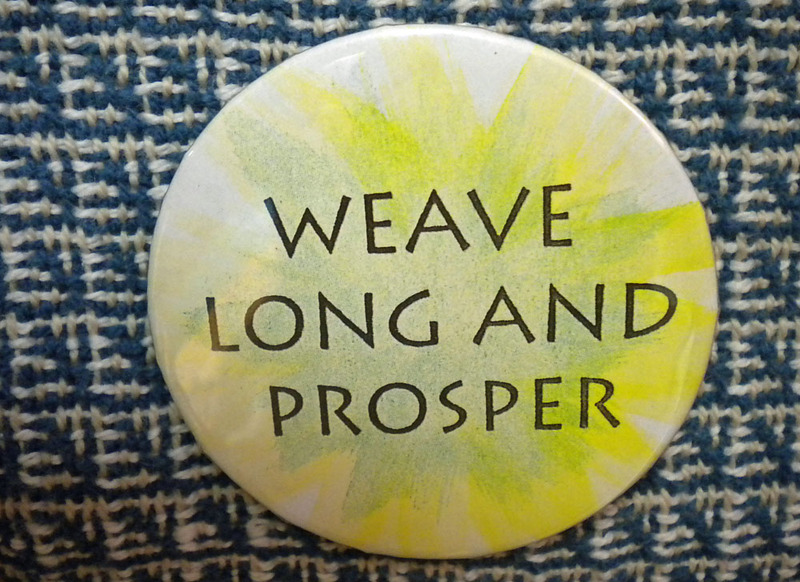 Other times, it means weaving A LOT of one type of thing. I have come to understand production weaving as weaving with an eye toward time and cost efficiency. I have friends who put on long warps for towels and then challenge themselves to weave every towel differently. They change the treadling. They change the weft color. They change something in each towel so that they are all related, but different. That takes some planning, but once you get going, it’s exciting to see the warp growing like a flower bed of multi-colored zinnias. And when that warp comes off the loom, it’s fun to see how all the towels work together. My mother once suggested that I weave one item in several different color choices like commercial stores offer. In a way, that’s what those long warps do. They produce several different towels, but all related. However, the difference between the handwoven and the commercial towels is the weaver has the freedom to make small changes in increments, whereas textile factories set up each loom to do one thing and one thing only. Small changes cannot be made without significant effort. Sometimes I will weave related items as sets. I intentionally combine four different but related napkins in a set. Once I wove a long warp all of different napkins and sold them individually so people could choose what they liked. Some liked this freedom. Others wanted sets of identical items. I am working on training myself to economize on my time: longer warps, tying on when I can instead of rethreading from scratch for every warp, weaving items in batches. But in the quest to become more efficient in my production, I don’t want to sacrifice the artistry that makes handweaving stand out over commercial fabric. When you shop, do you like to see a set that has identical members, or do you like variety in your “sets”? Tell me what attracts you. One of my sons-in-law made me laugh recently. Here’s the story. Many years ago, more years than I’d like to admit, I decided to make Roman shades for my daughters’ room. I had some commercial fabric with red and blue flowers on a pale pink background. That was my starting point. I chose yarn to match those colors and chose lace as the weave structure. 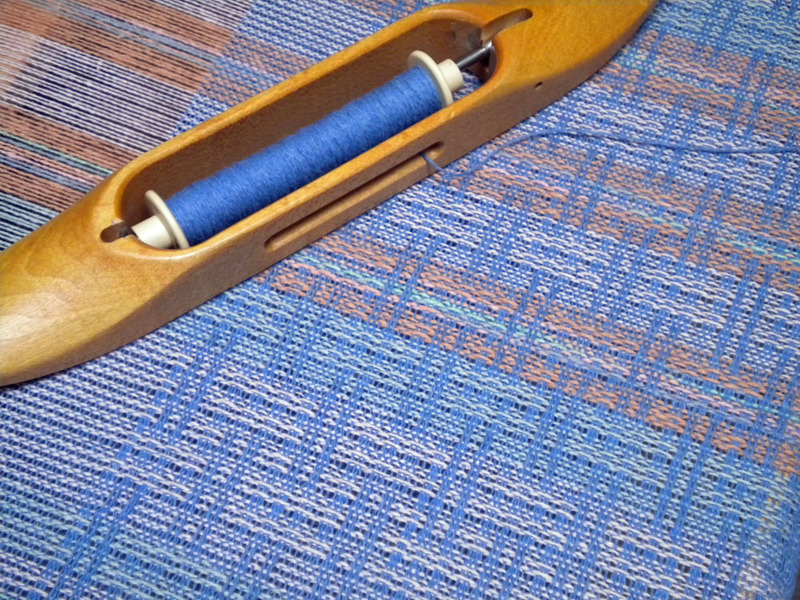 I wound the warp and started weaving, but the colors just didn’t “sing” the way I had envisioned them. Being a new weaver, I thought they would grow on me. Not so. After 11 yards, the cloth came off the loom and still, no “song.” I was so disenchanted that I folded the fabric and stowed it away. The curtains never came to be. Fast forward to this past winter when I decided to clear some of my stash. At the time, I was thinking about using yarn that had been on the shelf too long, but my curtain fabric still haunted my linen closet. Because I had used cotton in a lace weave, this fabric was actually a good candidate for towels. So I put scissors to fabric, cut the yardage into several towels and gave them out to my family. They aren’t pretty–the colors still don’t sing after all these years–but they work as towels. 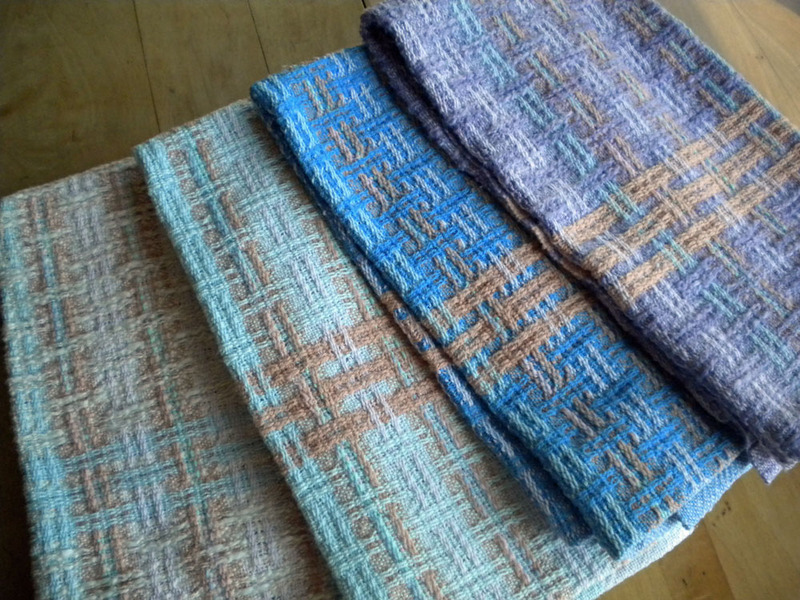 Now I am working on towels in the same weave structure, but with colors that work much better than my original ones. Can you hear the song?